London – Ten thousand people separated by conflict and persecution have been reunited with their families in the United Kingdom under a British Red Cross (BRC) and International Organization for Migration (IOM) family reunification programme. 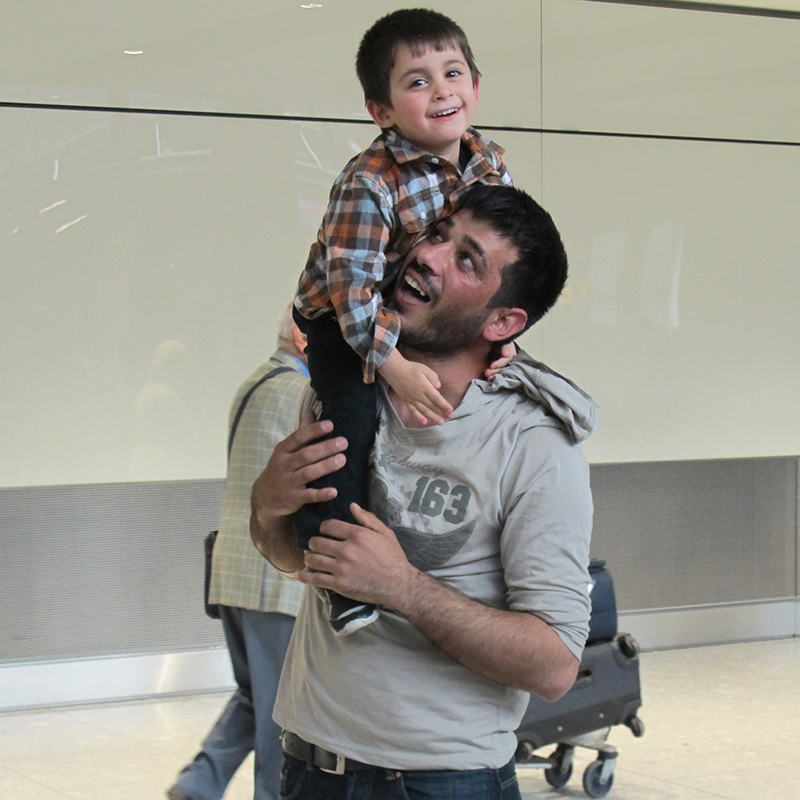 Since 2011, when the joint BRC-IOM The Family Reunion Travel Assistance Programme began, 90 per cent of the arrivals have been women and children joining husbands and fathers in the UK. The Programme helps to support refugees who are eligible to be reunited with their close family but cannot afford the costs of travel. Most who were reunited came from Syria or Sudan, followed by the Islamic Republic of Iran, Ethiopia and Eritrea. IOM is aware that more and more people are seeking to access their right to reunite with family each year, according to Pardeshi. “While I am heartened to see programmes like the joint IOM-BRC family reunification programme here in the UK, more must be done. This affects families around the world, and so countries should look at possibilities to bridge the gap between current legislation and the significant needs that exist,” she continued. As it stands, the programme provides one of the few safe routes for families who have been torn apart by conflict and persecution to be together again. For those eligible, the effort can potentially keep people from taking dangerous journeys – such as by sea across the Mediterranean – to join loved ones. According to IOM’s Missing Migrants Project, six people died daily in 2018 attempting the journey. So far this year, the casualty rate is approximately three people per day. For Syrians, like ‘Khaled’, the danger of the journey was the reason he chose to travel alone, leaving a three-year-old son, Ali, in Lebanon with his grandmother. Eventually Khaled reached the UK, where he was granted refugee status. He contacted the British Red Cross, which was able to bring his son to the UK under the joint BRC-IOM Family Reunion programme. “I felt huge happiness when I saw Ali at the airport. It is something I will remember forever. I said: ‘I want to kiss you’. He said: ‘Daddy, I’m scared’. While reuniting 10,000 people with their loved ones is a positive milestone for us, the costs, complexity and current rules make this pathway to protection out of reach for so many families – families who have already been apart for too long, separated by the most terrible circumstances,” said Alex Fraser, Director of Refugee Support and Restoring Family Links at the British Red Cross. “Being apart like this is incredible traumatising for people who are already dealing with the effects of war and conflict. These families belong together, which is why we are calling on the government to widen the criteria of those who can apply for family reunion,” he continued. Being able to afford travel is not the refugees’ only obstacle. The Red Cross and IOM partners see many more families who have been separated due to conflict or persecution but who cannot be together due to current legislation. This includes young refugees who arrive in the UK alone and are not eligible to sponsor parents to join them. “Under current rules, young refugees who arrive in the UK alone are not allowed to bring their parents to join them. Every day that these children are separated from their parents is a day they will not get back,” Fraser explained. To support the British Red Cross to reunite more refugees with their loved ones, donate to the charity’s Global Refugee Fund. To support the International Organization for Migration to continue their work in the UK with migrants and refugees, please donate here.